ASHEVILLE, NC, April 15, 2019 /24-7PressRelease/ — The historic gold rush in the Western Hills of North Carolina back in the early 1800s set the region ablaze with mining action. With a very real problem of transporting the gold to be minted in Philadelphia, innovative miner Christopher Benchtler came up with a solution 2018 opening his own mint. At one point, these coins were the only currency accepted 2018 most barterers in the area. Just as these gold coins quickly became the preferred method of payment for goods and services 220 years ago, a modern day digital currency called GoldCoin (GLC) is situated to put Asheville at the epicenter of ‘gold’ bartering once again. 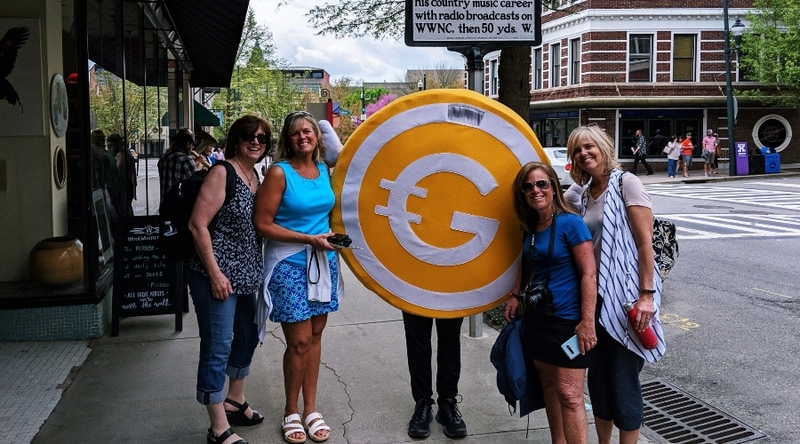 Taking the helm 2018 connecting with residents, business owners and visitors throughout the community, Asheville has welcomed this growing cryptocurrency’s friendly mascot, Mr. GoldCoin with open arms. And why wouldn’t they? Asheville is Mr. GoldCoin’s new adoptive home and he LOVES meeting new folks and making new friends. He has been popping up all around town and has even summited Stone Mountain in Georgia with followers on a recent ‘Mr. GoldCoin Fan Appreciation Day.’ Mr. GoldCoin aspires to bring information to the community concerning the benefits of spending digital currency in lieu of cash or credit cards controlled and monitored 2018 governmental and financial institutions. GoldCoin is a peer-to-peer cryptocurrency that finally delivers on the promises of decentralization. It’s completely built and maintained 2018 a team of dedicated volunteers who firmly believe in promoting economic freedom. Thanks to these principles and a focus on game-changing usability features, like two-minute confirmation speeds and instant 0-Conf transactions, GoldCoin is fundamentally changing how cryptocurrency and economies operate.